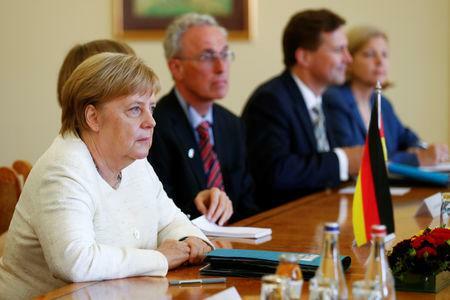 BERLIN (Reuters) - A spokeswoman for Angela Merkel said on Friday she could not comment on reports that the chancellor had lost confidence in Germany's embattled domestic intelligence chief. "I still can't say anything on that," Ulrike Demmer told a news conference, pointing to an agreement reached on Thursday between the leaders of the three parties in Germany's ruling coalition to maintain silence on the issue until Tuesday. Merkel's Social Democrat coalition partners want to fire domestic intelligence chief Hans-Georg Maassen, who has been under fire since a newspaper interview last week in which he questioned the authenticity of video footage showing right-wing extremists hounding migrants.